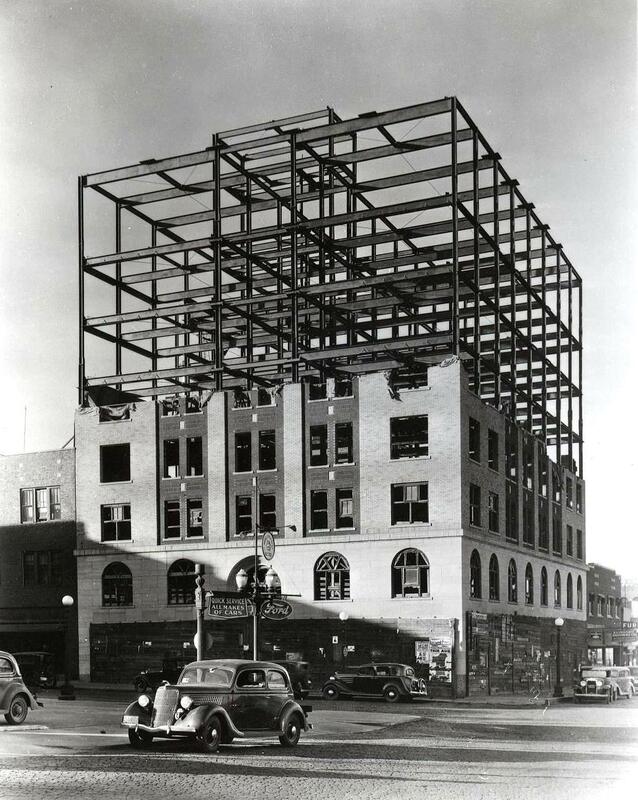 Ellison’s planned a three story department store with another two floors of office space on top. 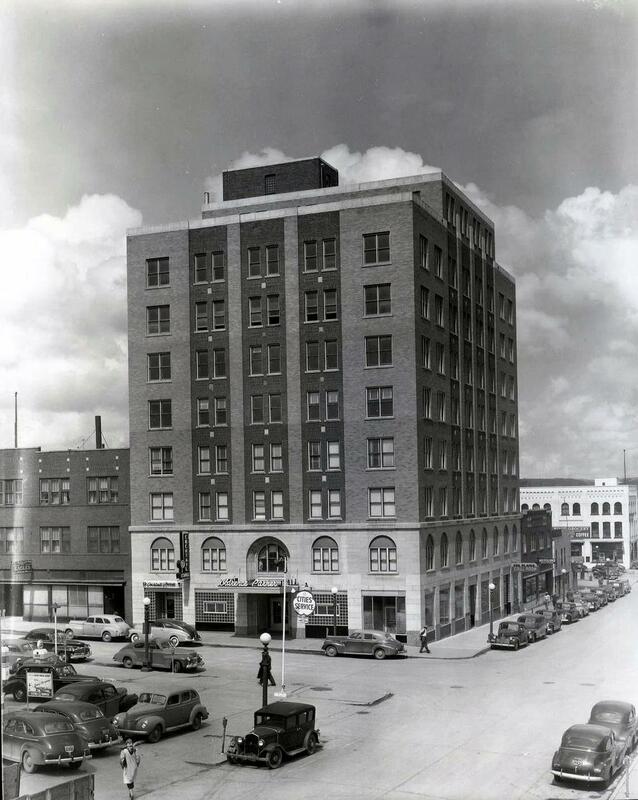 The first three floors were built but not floor 4 and 5 as George Vaulker started building his office building on the northwest corner of 1st Street and 1st Avenue Southeast. 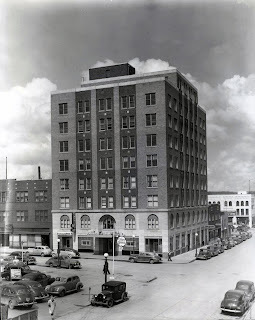 Thinking there would be a surplus of office space, the Ellison Building remained at only three floors. The restaurant in the Ellison Building was 0n the second floor. The Vaulker office building was never completed. The bottom two floors were all that was finished. The top floors were open with just the supports showing. The building was referred to as “The Sparrow Hotel” for many years as the birds were the only tenants. Twenty years later Clarence Parker bought the unfinished building and converted it to the Clarence Parker Hotel. 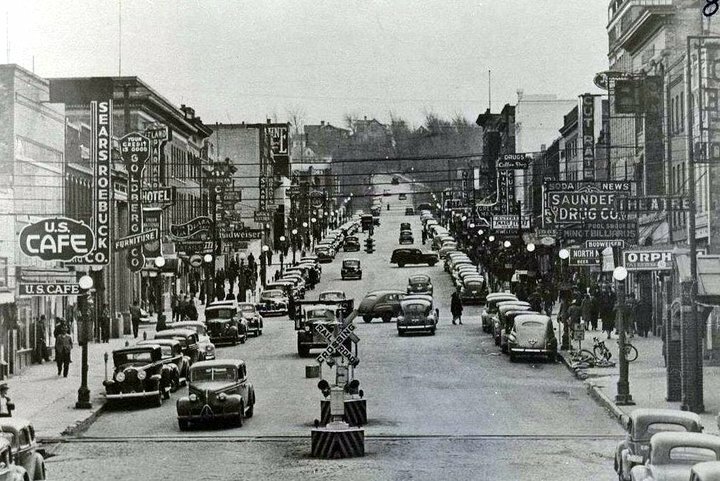 In 1953 President Eisenhower stayed in Minot while visiting the Garrison Dam. While in town, he rented a suite rooms at the Clarence Parker Hotel. He also had Charlie Damakis as his personal chef during his stay in Minot. By the way, it seems that President Eisenhower was a bit disappointed when he saw the Garrison Dam. Apparently he was expecting a dam similar to the Boulder Dam. We lived in the penthouse suite in 1954. It had gold bathroom fixtures as I remember. And then it became The Parker Suites. My Mom lived there in a big 2 bedroom apartment of the 8th floor (she loved the views) from 2004 until she passed in 2015. Really enjoyed all her friends there, the activities she could participate in and the convenience of the Parker Coffee Shop on the main floor. In addition --- I remember that the Minot Rotary Club met there in the 1950s and 60s. My Dad took me along to their noon meetings on occasion. Rotary children's Christmas party was the most fun!